Attend the Leadership Summit for Women for an evening that will inspire, instill confidence and provide a network for future leaders in our community. The theme this year is “Press for Progress,” inspired by the International Women’s Day 2018 campaign theme. The event will include a session with the AfriCAN delegates that attended the African Youth and Governance Conference in Accra, Ghana; MSU President Ikram Farah and MSA Vice President (Internal) Brayden Spjuth will also provide opening remarks. Visit the Student Success Centre’s website for more information about this year’s speakers. 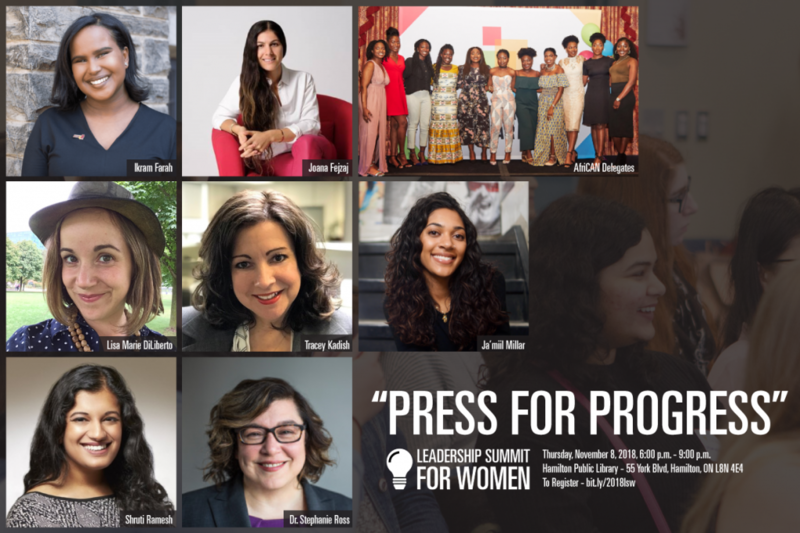 The Leadership Summit for Women strives to be an open and inclusive event with speakers reflecting the diversity of experience that makes this city great. They also welcome feedback on how to continue to improve this work. The Leadership Summit welcomes First Nations, Metis and Inuit peoples, racialized persons, persons with (dis)Abilities, LGBTQ2SIA persons and allies. Brought to you by the McMaster Student Success Centre, McMaster Alumni Association, Mohawk College, YWCA Hamilton, and Workforce Planning Hamilton, the Leadership Summit for Women will take place at Hamilton Public Library (Central Branch) on Thursday, November 8, 2018 from 6:00 p.m. to 9:00 p.m. Register to attend at bit.ly/2018lsw.